Your Screens May Be Destroying Your Windows & 6 Things You Can Do to Save Them! Your windows are one of the most expensive investments you can make in your home. Considering that replacement and installation costs can range from several hundred to several thousand dollars per window, you naturally want to do everything you can to protect your investment. Incredibly, most homes have a relatively inexpensive accessory to their windows that may actually be destroying them! 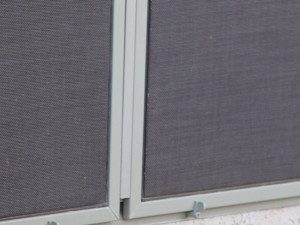 The most common window screen is the metal mesh screen placed outside the window. Over time, the metal mesh (and possibly the metal frame as well) on this type of screen begins to oxidize as it is exposed to the elements. This makes the screen harder to see through, giving it a white or grey hazy look. Even worse, the oxidation transfers from the screen to your window glass when it rains. This creates stains on your window that can prove difficult and expensive to remove. Left untreated, these stains can eventually etch the window glass, causing real problems. If you have ever tried to clean windows that have screen oxidation stains on them, you have likely had the stains reappear on the window as soon as the glass dried. The stains can present themselves as white spots or a white or gray haze on your glass, depending on the severity of the stain. 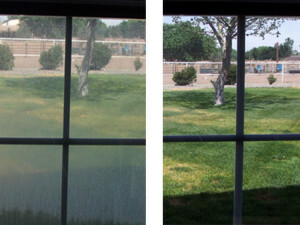 Normal window cleaning techniques, including those of a professional window cleaner, are rarely sufficient to completely remove these stains. There are a variety of chemicals and treatments designed for hard water stains that also may be effective at reducing or eliminating the stains from screen oxidation. However, the chemicals are expensive, as is the procedure when performed by a professional window cleaner. If chemical treatment proves ineffective, the only remaining option short of replacing your window is an even more expensive attempt to restore the glass. This is done through a combination of chemical applications and grinding the top layer of glass down to a point that has not been etched by the oxidation. There are several simple steps you can take to prevent (or at least reduce) oxidation stains, listed here in order of effectiveness. 1. Permanently Remove Outside Screens. For some, this won’t be a practical solution because they want the benefit of their existing screens. If it can be done, moving the screens to the inside of the window or eliminating them altogether will also eliminate further staining of your window glass. Usually, windows that receive the most direct sunlight experience the worst screen oxidation stains. Even removing only these screens will result in a significant protection of your window investment. 2. Store Outside Screens During the Winter. If permanent removal of the screens isn’t desirable, then consider at least storing them over the winter when windows won’t be opened anyway. Some people object to even this step on the grounds that an unseasonably warm day might cause them to want to open their windows, thereby allowing insects inside their home. If that happens during the winter or early spring, however, there likely are no insects that you have to worry about, so you should consider this as an alternative to permanently removing your screens. Not only will it improve the condition of your windows, it will also extend the life of your screens. 3. Replace Screen Mesh With a Non-Oxidizing Material. Replacing your screen mesh with a non-oxidizing material such as nylon provides several benefits. First, it will immediately provide an improved view through your windows. Nylon mesh can look somewhat darker from the outside looking in (which may actually be a privacy benefit), but often makes the view much clearer looking out from the inside. In any case, it provides a dramatic improvement to looking through the oxidized metal of your existing mesh. Nylon mesh is typically less expensive than metal mesh and may be less durable. However, when you consider that the metal mesh can begin to oxidize as quickly as the first year or two after installation, the durability factor becomes a less convincing reason to retain the metal mesh. 4. Chemically Treatment of Oxidation Stains. A chemical treatment of your stained windows can cost between $20-30 per window when done by a professional window cleaner. You should request that your professional test one of your windows to see if the treatment will be effective or not. I perform this test as a standard procedure for my customers and don’t charge them anything if the test proves that the treatment won’t be effective. Given the expense involved, I won’t provide this service unless the home owner has already had me or someone else replace their screen mesh with a non-oxidizing material. 5. Window Restoration Treatment for Etched Stains. At a cost of $50 or more per pane, window restoration treatments are expensive, but not compared to the hundreds of dollars it costs to replace the window. This is your option of last resort when the oxidation stains have etched the glass to the point that a chemical treatment is ineffective. The restoration process involves grinding down the surface of the window glass to remove the etched surface and reveal the smooth glass below it. One possible negative result is a slight distortion of view through the restored glass. If you’ve seen very old glass windows that were made prior to modern manufacturing techniques, they have an irregular look to them when you look through the glass. In fact, many home owners refuse to replace their old window glass because the look it creates is highly prized by some. You want to minimize this effect in a window restoration project, however, which is why you should only have it done by a professional. 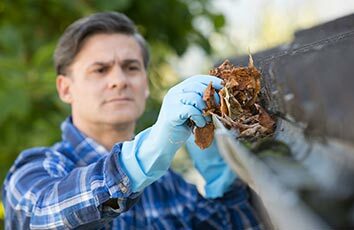 As with chemical treatment, we don’t provide this service to our customers until after they have replaced the metal mesh on their screens. 6. Regularly Have Windows Professionally Cleaned. Having your windows regularly cleaned by a professional can keep oxidation stains from becoming so severe that they impair your view or even damage your windows. 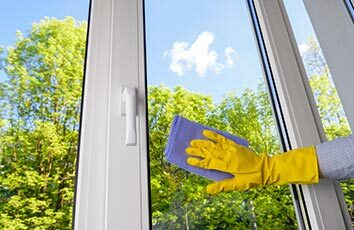 I often get asked, “How often do most people have their windows professionally cleaned?” The most common schedule is to have them cleaned inside and out in the spring or fall, and at least one outside only cleaning six months later. 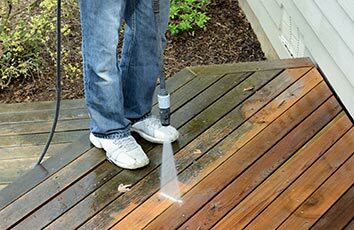 We offer outside only cleanings at a surprisingly affordable cost, particularly when combined with one or more of the other home exterior detailing services we provide such as pressure (or soft) washing, gutter cleaning, gutter whitening, etc. The key is to get the outside of your windows cleaned often enough to avoid stain buildup that becomes considerably more expensive to remove. Metal mesh screens can cause significant and costly oxidation damage to your window investment, but as discussed here, there are ways to mitigate and even eliminate the threat. Has a Vacuum Seal Break Damaged Your Window?